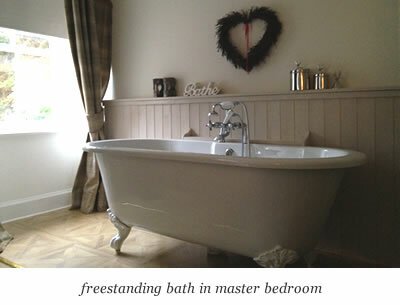 Highland Coach House ... your luxury retreat in one of the prettiest glens in the Highlands. There's an Nespresso coffee machine with a selection of capsules and you can bring your own too if you have a favourite blend! If you need some inspiration in the kitchen there’s a selection of Scottish Cookbooks from some great Scottish names like Claire MacDonald and Nick Nairn. The bathroom is adorned with Arran Aromatics products and beautiful candles to help you relax after all those long walks in the glen. You'll find cosy bath robes and slippers in the main bedrooms perfect for curling up in front of the open fire. There’s a small DVD library too with a selection of classic films so why not pour yourself a dram and watch Whisky Galore! When it’s time for bed you can be rest assured of a good sleep when you curl up in bed under the divine duck feather duvets. The Coach House is situated in an idyllic rural location yet within easy commuting distance of Inverness. Scatwell consists of several converted properties that once belonged to the main house and now consists of a small community surrounded by a beautiful forested area ideal for long walks and cycling with excellent Fishing and Golf nearby. The Coach House forms part of the original residential Scatwell estate in the heart of Strathconnon lying around 6 miles West of the hamlet of Marybank. The Coach House has a large lounge with a wood burner. The property is decorated in a stylish modern and contemporary boutique style which makes this a very comfortable property which reflects the landscape and nature nearby. The dining kitchen features an open fire and is complete with a ceramic range cooker, retro fridge freezer, washing machine, tumble dryer and dishwasher. On the upper level there are two large double bedrooms and the master is complete with a freestanding bath and wood burner. The property sleeps 4 + 2. The master bedroom is furnished with a superking bed whilst the second bedroom is furnished with two guest beds which can be joined together to make a Superking too or twin if this is the preffered option. There are also two pull out guest beds in the second bedroom. The bathroom is newly refurbished and there is a large shower in here too. We want you to make the most of your highland vacation so please don’t hesitate to get in touch with any questions or queries.